I place the word euthanized in q-marks because an animal right based justification for euthanization (based upon my reading of Tom Regan’s The Case for Animal Rights) is extremely difficult to achieve. It may in fact be more accurate to say that Lou was killed. Media reports confirm that Green Mountain College, according to President Fonteyn, “euthanized” Lou, age 11, and buried him in an undisclosed location. 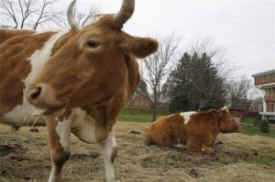 Lou was the ox with an injured leg, an injury sustained from pulling a plow on the college’s “sustainable” farm so undergraduates could study pre-industrial farming. He will be missed by those who knew and did not know him alike. I place the word euthanized in q-marks because an animal right based justification for euthanization (based upon my reading of Tom Regan’s The Case for Animal Rights) is extremely difficult to achieve. It may in fact be more accurate to say that Lou was killed. From a gut-level instinctual moral outrage point of view, it inded seems more accurate to say Lou was “killed.” However, that fiery word needs to be in q-marks, too, because, at this point, here’s the thing: we don’t know if Lou was “killed” or “euthanized” and, until we do, it is important to respond accordingly, without presumption and with continued persuasion and civility despite our anger, outrage, etc. There is, of course, considerable suggestive evidence that GMC acted in bad faith, but nothing has yet been verified, something that may take some time. Bill still lives. According to Fonteyn, he will remain in possession of GMC and “will continue to stay at Cerridwen Farm and receive care consistent with appropriate livestock practices,” whatever that exactly means. So, when it comes to Bill, we still have more questions than answers, more ambiguity than clarity. Again, though, he is alive and, for whatever it’s worth (something, I would think), Lou will not become hamburger and Bill may have a chance to live out the rest of his life in relative peace. So, with the warning in mind that Fonteyn is looking for any excuse to brand activists as threatening and demented zealots, we must still keep up the pressure to spare Bill an unjust fate.